If you're a Johorean, you would know that the largest IMAX Auditorium has just launched in TGV Cinemas, Aeon Tebrau City last week! 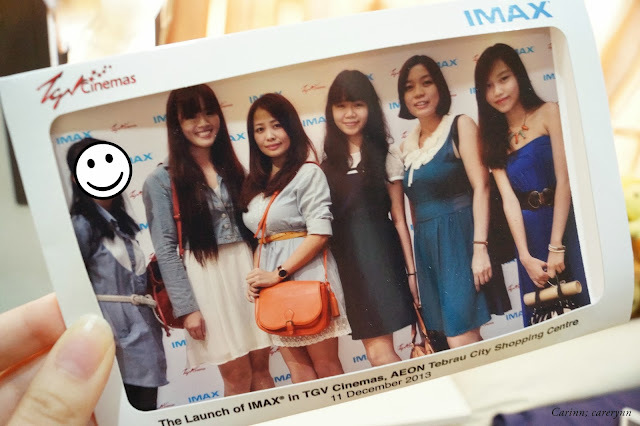 It's one of the biggest and most happening thing to happen in JB and I'm blessed to have been able to attend the launch party on 11 December 2013 (11/12/13) with three of my friends, courtesy of TGV Cinemas and The Butterfly Project! Tanjong Golden Village Cinemas (TGV) is one of Malaysia's premier film exhibition companies but has also established a name as a pioneer in the cinema industry since they started operations in 1995. 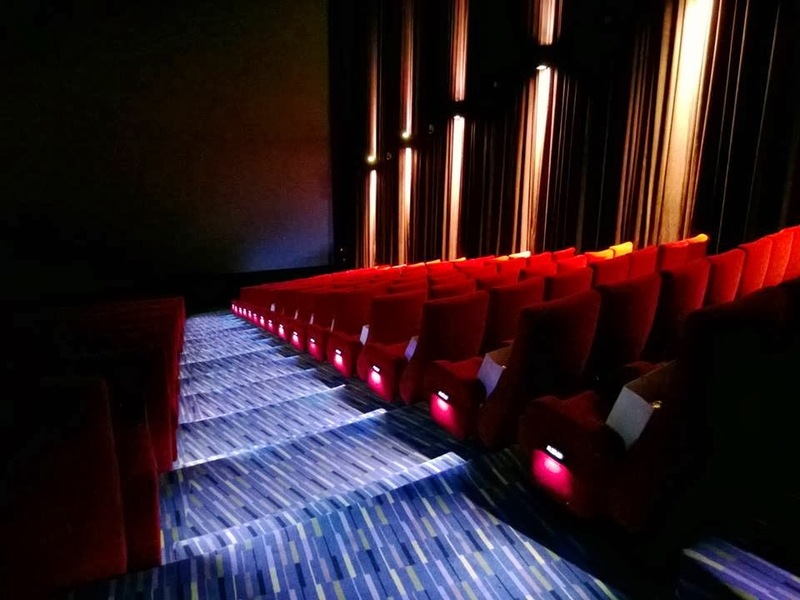 TGV is constantly upgrading and renovating their theatres to give movie-goers the ultimate cinema-going experience. Aside from the normal theatre halls, TGV offers 3D experience, a Beanieplex hall and IMAX. Currently, there are three IMAX theatres in Malaysia - TGV Sunway Pyramid, TGV 1 Utama and now the first threatre out of Klang Valley is at TGV Aeon Tebrau City. 1) Cutting-edge projection system and Digital Re-mastering process that delivers crystal-clear images. 2) IMAX customised theatre geometry which means the sceen is higher, wider and slightly closer and curved to give off a more realistic and immersive experience. 3) Coupled with a powerful digital surround sound system, you really feel as if you are part of the movie! I received the invitation before 4 December so I had ample time to prepare for the event. In a dilemma of which of my friends to ask along with me as most of them are overseas. In the end, I invited my boyfriend, my sister and Elyssa, my good friend who just came back from Ireland. Registration starts at 7pm. I was surprised to see so many people from the media there. Journalists from The Star and Sinchew Daily and many VVIPs as well. Wow, so grand.. The tickets were in this scroll! I like that it is a unique presentation and also a homage to the Hobbit movie! As an added bonus, TGV generously provided 8 IMAX Access tickets for future redemption, valid till 28 Feb 2014. Eight tickets means 2 for each person omg I can't wait to go and watch movie in IMAX again! There was a board prepped at the entrance for photo-taking and there's a professional photographer there to snap photos of us and print it instantly for collection! Movie starts at 9.30 pm so we had plenty of time to mingle around and have some refreshments. The food was catered by Niniq Bakery and Bistro, one of the popular bistros in JB. Since we had our dinner earlier on, we only ate some desserts. The food definitely did not disappoint and there was quite a wide selection! Big thank you to my awesome boyfriend for carrying the DSLR bag and also my stuff cos I was running around taking photos. Psst.. Tell you a secret. It was also our 11th monthsary on that day so thanks to the sponsors for the unique celebration! Photo credits to this chick here who snapped photos for me and of the event the whole night! Thank you so much, Ely! A group photo with the other invited Butterfly bloggers - LerLer (she requested for her face to be covered due to privacy concerns), Qiaoqiao, Audrey, Sherlyn and Kim. 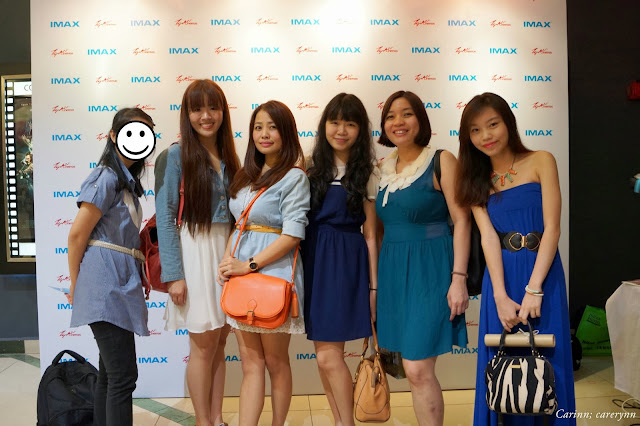 You can read about their IMAX experience too on their blogs! Truth be told, there aren't many chances to attend events in JB. 10 JB bloggers were supposed to be invited but only 6 of us responded lol. I hope more aspiring bloggers will join the Butterfly Community and maybe we can have more review and event opportunities in JB or even a bloggers' meetup! It was so nice meeting everyone, some I approached and some approached me. Chatted with everyone and of course, take photos! The next event was the officiating ceremony and also a lucky draw session. Mr Gerald V. Dibbayawan, the Chieft Executive Officer of TGV Cinemas and Mr Preetam Daniel, IMAX Director of Sales for India and South East Asia were there to kick off the event. He also added that the mind-blowing and sensorial-stimulating movies can only be appreciated from the silver screen and cannot be duplicated from one's notebook or tablet devices. Amen to that! Lucky draw time! Congrats to the 5 lucky winners who won 4 IMAX tickets each! Next, the moment that everyone has been waiting for... Entering the IMAX Hall to watch Hobbit 2! As you can guess, the dress code was blue. Look at our tickets, they look like certificates/ contracts! Happy girl is happy with her free popcorn and mineral water. The entrance is so pretty! <3 We had to queue up for our 3D glasses. The people giving them out had gloves on and the glasses were in resealable plastic bags, so I guess they must be handled with care. Remember to return the glasses after the movie! They're for rent, not for sale! Inside the theater, we had another surprise. We did not expect goodie bags on our seats! Aww.. There's even a blanket inside to keep warm while watching the movie. TGV is so thoughtful! Everyone is excited for the movie to start. We're seated at H14-17 which is in the center, but a little too close for comfort to the screen. 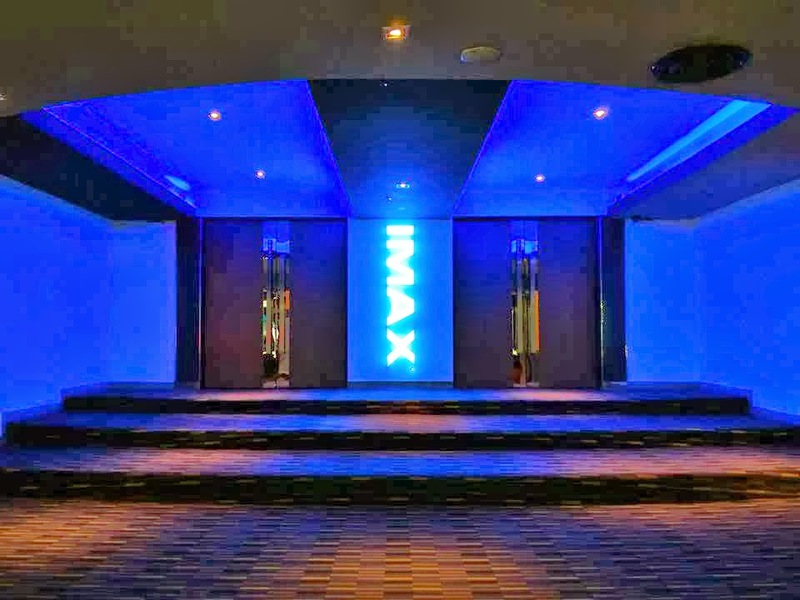 The largest IMAX Theatre in Malaysia boasts 362 comfortable seats. Behind the screen, it boasts a world of technology of proprietary software, architeture and equipment pioneered by IMAX. The screen is so huge, it literally expands from the floor to the ceiling! It is curved, and so are the seats. The speakers are evenly distributed around the hall for maximum listening environment. Whether in 2D or 3D, you'll be mind-blowned by the awesome effects of the movie experience! A lot of effort has gone into building this beautiful theatre; from the carpeting to the lights to the seats and speakers; admire its beauty when you enter the hall! Lol. Before the movie started, we were shown a brief video explaining "What is IMAX?" It's very entertaining and informative! You can watch it here. 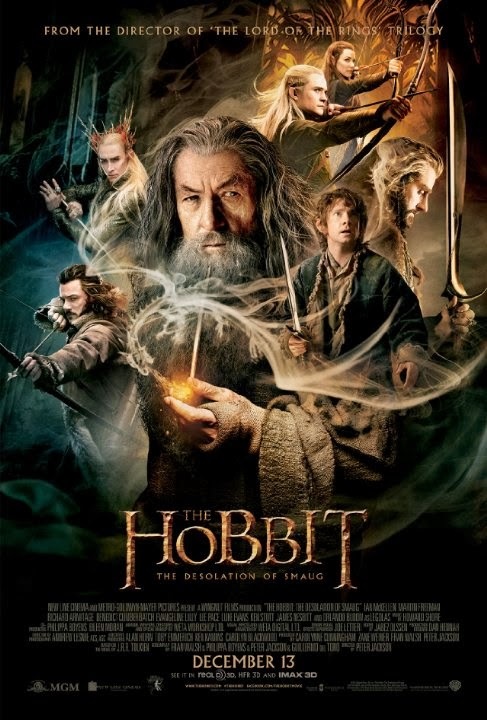 Hobbit 2: Desolation of Smaug is a must-watch movie of 2013! I watched the first one which makes this one easier to understand. Action-packed with elves (omg Legolas! ), dwarves, sword-fights and DRAGONS. Make sure you watch it, and make sure it's IMAX! I did get a headache due to glasses not fitting my face well but other than that, everything was great! Because the screen is closer and wider, you really feel as if you're part of the movie with swords being jabbed in your face and Orcs jumping at you lol. And the surround sound system made my heart race so many times that I had to grab boyfie's hand to keep from screaming. The Hobbit 2: Desolation of Smaug in cinemas now. 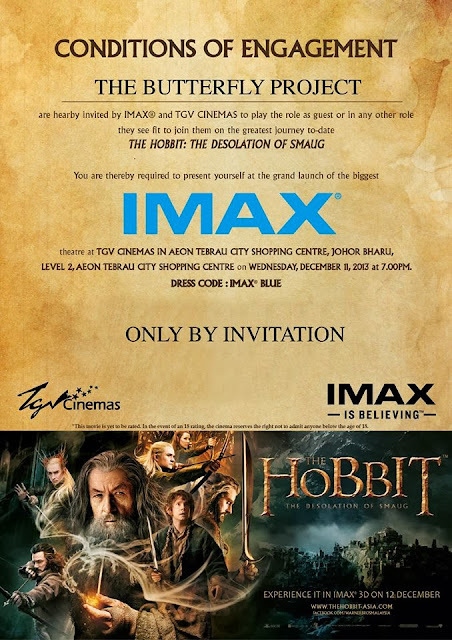 Make sure you go catch it in IMAX TGV Tebrau City. Tickets are priced at RM28 + RM4 for 3D Glasses rental. For more information, log on to tgv.com.my or like their Facebook page and follow their Twitter account. Don't forget to check out The Butterfly Project's website and Facebook as well! 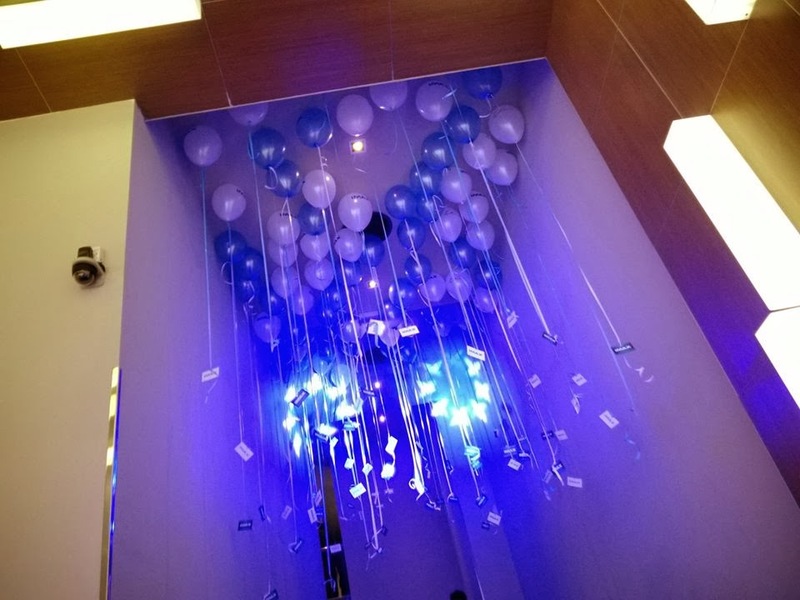 Disclaimer: Even though the event coverage was sponsored, the review is based on my personal thoughts and experiences after attending the event. nice 2 meet u ..